Yesterday I got to have a microscopic vacation, 12 hours completely by myself. Wow! What did I do to earn this wonderful reward? Nothing; Ian made it possible out of the goodness of his heart. Also, he understands how much training for this upcoming Gran Fondo means to me, and he’s being extremely accommodating. 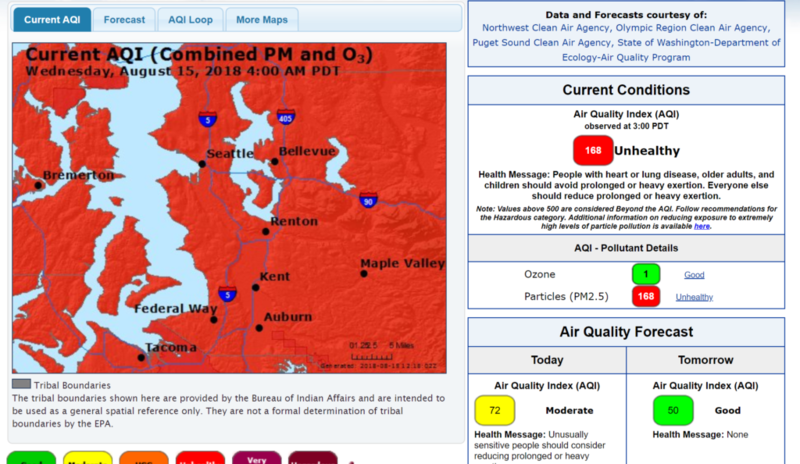 Double also, the Washington Department of Ecology once again rated air around here “Unhealthy,” thanks to the wildfires that have filled our air with toxins and haze for the last three weeks. My solo adventure stemmed from a desire to find somewhere else with better air to train. After much debate and route consideration, I opted to ride to the Mt. St. Helens National Volcanic Monument Johnston Ridge Observatory. Say that six times fast. I did this for two reasons: 1. 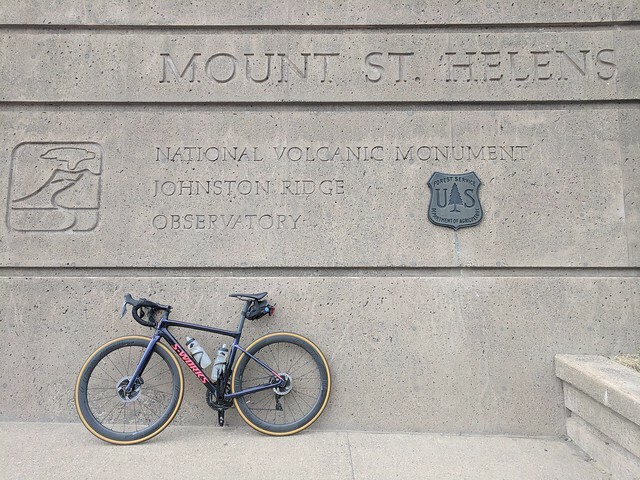 As mentioned in the first challenge, I’d be riding alone, and I knew the route (there are literally no turns), which also met my training requirements to ride long, steady climbs; and 2. 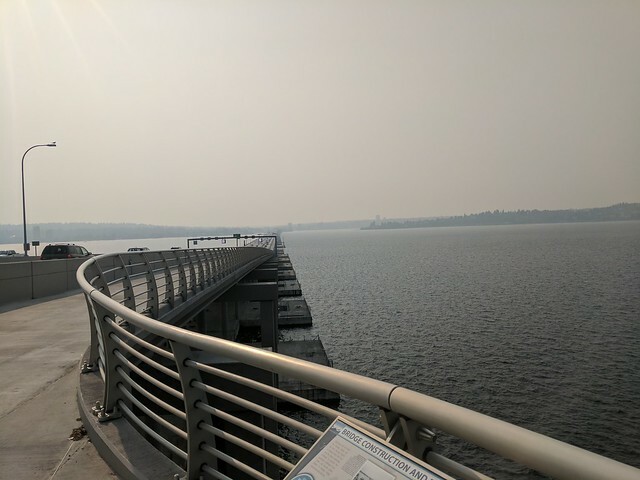 The air quality in southwestern Washington looked quite a bit better than the Seattle area. Challenge number two: We own one car. This becomes a problem only on extremely rare occasions, such as yesterday, when we have to go opposite directions. We solved this challenge easily by borrowing a car from my parents. But also incidentally, the one car we own is all-electric. Again, has never yet proven problematic. We rarely want to do drives that exceed the 250-ish miles we can go on one charge. Well, except yesterday. Mt. St. Helens is about 120 to 150 miles from our house, depending on where you stop. I opted to stop at the Mt. St. Helens Visitor Center, 47 miles from Johnston Ridge and about 125 miles from our house. (Fun fact: The visitor center is run by Washington State Parks, so you can park there for water and bathrooms; use your Discover Pass to park all day. Handy!) I knew, from mapping the route ahead of time, that I could get to the visitor center well within range for our Bolt. However, it wasn’t well within the range roundtrip. Like Scarlett O’Hara, I decided to think about that “tomorrow.” And by “tomorrow,” I actually meant after I finished my ride. Suffice it to say that I arrived at the visitor center after about a two-hour drive. Then I rode my bike a long way, up a lot of hills. I felt good–it was actually nice to ride alone, keeping my own pace, not having to wait or try to catch up. My left leg, which I’ve struggled with, never experienced the crippling pain it gets every ride; but I also saw only 30% to 40% power from that leg. More on that in another post. At the halfway point I stopped at Johnston Ridge Observatory, paid $8, and enjoyed their nice clean restrooms. I also looked out, but overall the view wasn’t what it has been in the past. 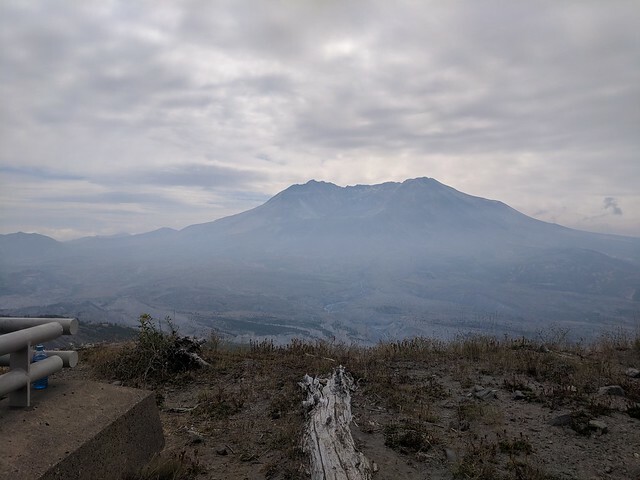 I’d ridden through a layer of clouds at around 3,000 feet (and wished I’d brought more than just a vest and light arm warmers), which looked like riding through a white nothing, and smoke did haze the view. It was better than at home, but not as good as in past years. After a quick snack, I started back down… although it’s not exactly all downhill from there. There’s one significant climb on the way back, and honestly even the small little dips and rises feel plenty hard by the time you get there. Also, a west wind develops in the afternoon, and of course I spent the entire time riding west. 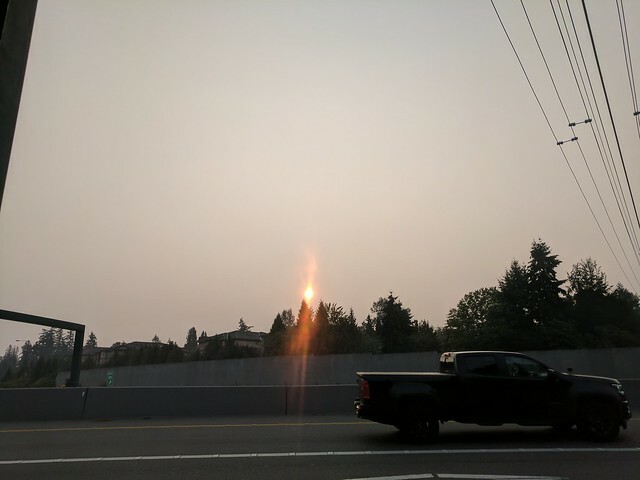 This improved air quality, but made my ride quite a bit harder. Riding up little bumps with a wind felt like sheer torture. 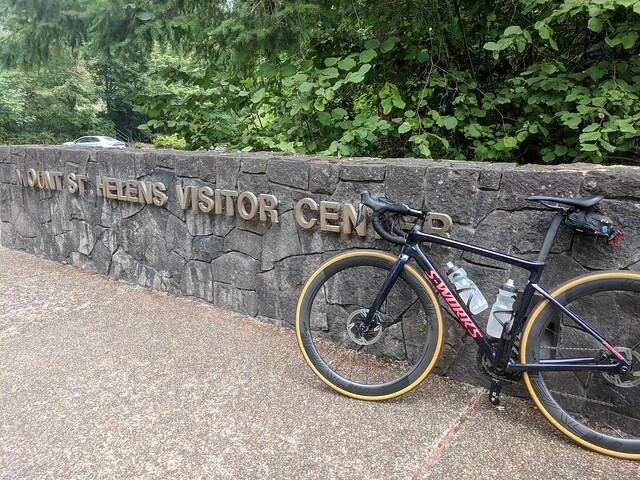 Honestly, one of the happiest moments of my ride was when I thought I had a mile to go, and I saw a sign for the visitor center 1/4 of a mile away. Hallelujah! The car was still there (I did worry a bit), and as I pulled up and started to discombobulate my gear, I felt a raindrop. Then another. Then several more. I hastened my putting-away procedure and as I got into the car the rain started in earnest. Not that earnest, though, because only a couple miles away it stopped and I never saw another drop. Now we get to the third challenge: Range. When I got started driving again, the car estimated I had 119 miles of range. But I’d driven 125 miles to get there. 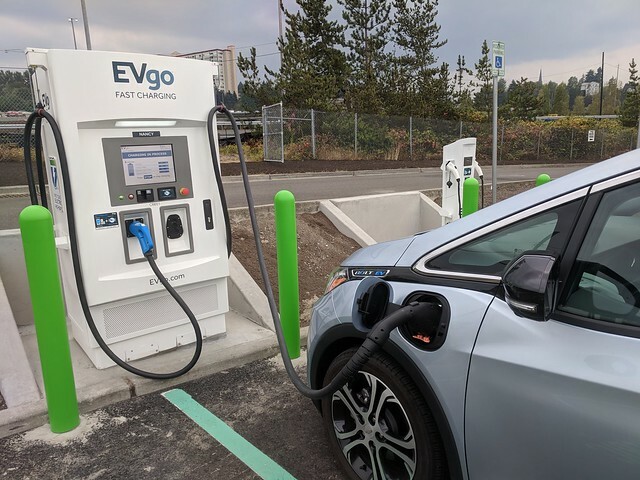 After consulting with Ian, who’s really the expert on the car since he drives it every day, I decided to stop at the fast charger at the LeMay Car Museum in Tacoma. I’d been to the museum before, and it’s right off the freeway. 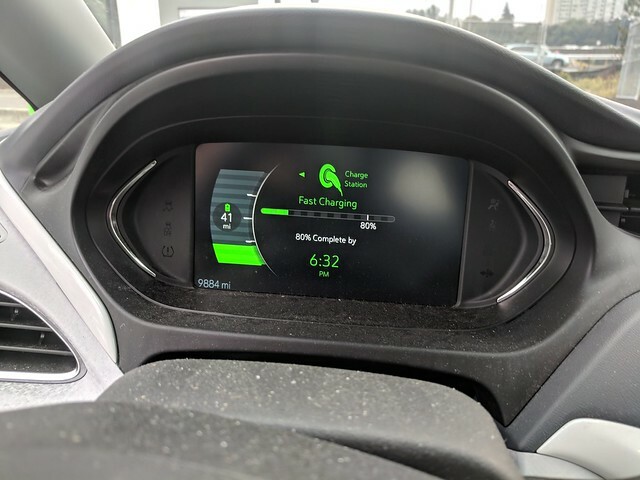 But I’ve never tried fast charging the car; we have a level 2 charger in our garage, which is ample for charging overnight, but too slow for a trip like this. By the time I got there, I had an estimated 40 miles of range left, but 45 miles to get home — and 40 miles is just an estimate. Freeway driving tends to drag down the range substantially. So I stopped and found the charger. After a little finagling (the credit card reader on one charger didn’t work, but it worked fine on the other charger. Thank goodness there were two! ), I got charging started. The speed of charging astonished me. I could’ve left after 15 minutes, but Ian wanted me to stay for 30 minutes to see if it really added 90 miles as advertised. It did. That’s impressive. I blithely drove the rest of the way home without worrying about my charge level. With that I dealt with challenge number three. I got home just over 12 hours after leaving, just in time to read Benji a bedtime story and say goodnight. Then I ate more food and went to bed. Despite the smoke, it was a good day. 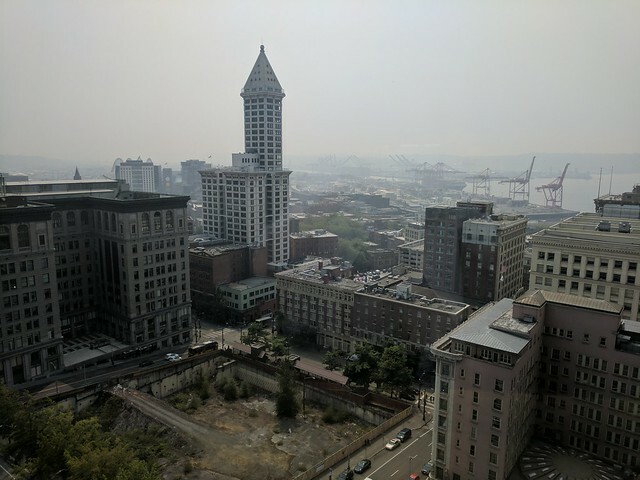 Here in Seattle, people always joke that maybe climate change wouldn’t be so bad. We wouldn’t mind a little extra warm weather in the summer, thank you very much! Well, here’s what that looks like. 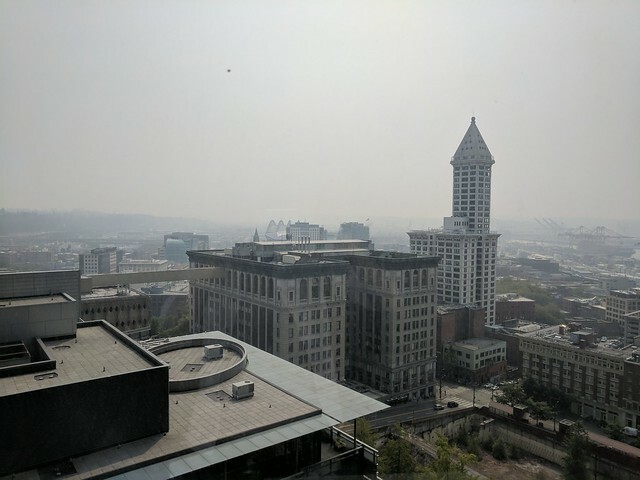 Thanks to smoke from wildfires burning in Canada, Eastern Washington, Oregon, and California, the air quality has degraded to dangerous levels around here. It gets especially bad when our handy-dandy oceanic air conditioner turns off, like it did on Sunday. Now we can’t go outside. Our home is hot, and getting hotter, and we can’t cool it off because we can’t open the windows. I can’t commute home by bike, let alone keep training, because I can’t breathe — it hurts eyes, nose, and throat to be outside any extended period of time (like more than 10 minutes), and goodness only knows the long-term impact to our lungs. We all feel low-grade sick, with runny noses, sore throats, and coughing. Here’s what that looks like on the ground. 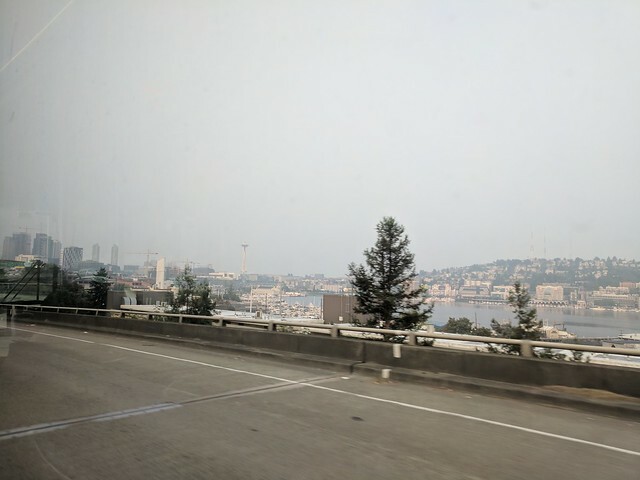 This is what climate change looks like in the Pacific Northwest. Now tell me that we should consider cutting the Clean Air Act, vehicle fuel standards, and other environmental protections designed to combat climate change.